Randy has his weekly challenge at GeneaMusings.com ready for us. This week his challenge asks us to find our genealogy statistical reports. Then, find the answer to how many people, places, sources, etc., are in the database? 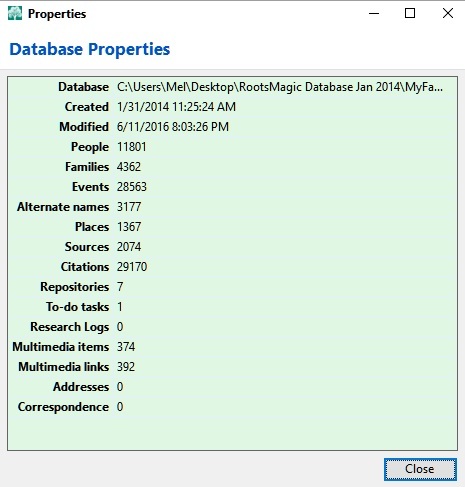 I use RootsMagic 7 to maintain my family tree database. Normally, I would head over to the statistical report, but Randy’s article shows that I can get these numbers using File>Properties. I thought it was funny that I have 7 Repositories and 1 To Do Task. I’ve never entered these things. I must be sleep inputting. I wonder what they are? I went further and ran the Surname Statistics List to see what my top 10 surnames. This is also found under Reports>Lists>Surname Statistics. ??? 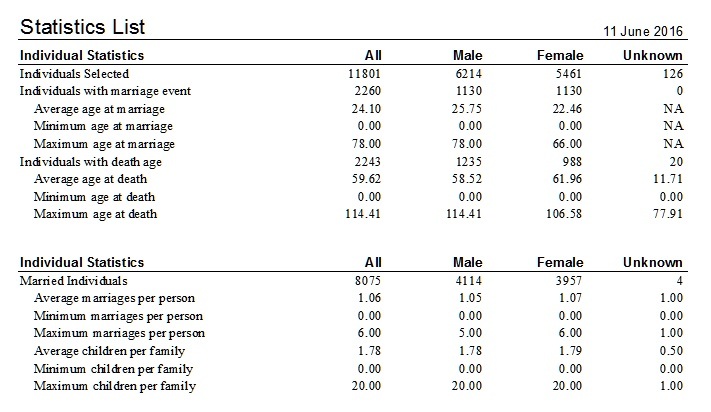 (my unknowns) has 733 individuals. I think I need to work on that! It doesn’t surprise me that the top 10 suranmes are all from my Portuguese side of the family. These families are huge and go many generations. I’ve also put a lot of time and energy into researching the associated lines. They are in my database as well. It does surprise me that I have to go all the way down to number 20 to hit one of my French surnames, Lassalle. I only have 66 of those. What’s deceptive about these numbers is that the 259 does represent the total number of direct line descendants who should have been using the Pacheco surname. My great grandfather used Smith to hide his identity when he smuggled from Hawaii to California. The Smith name gets carried forward. Then, his brothers switched to Algravia, Algarvio, Algrava, and Algarva (sometimes the same guy used all these spellings). Their children used those variants and Pacheco. These types of name variations are not noted in my French, Irish, Welsh, British, and Australian lines. At least, not so far! Thanks for another interesting way to analyze my genealogy information, Randy!